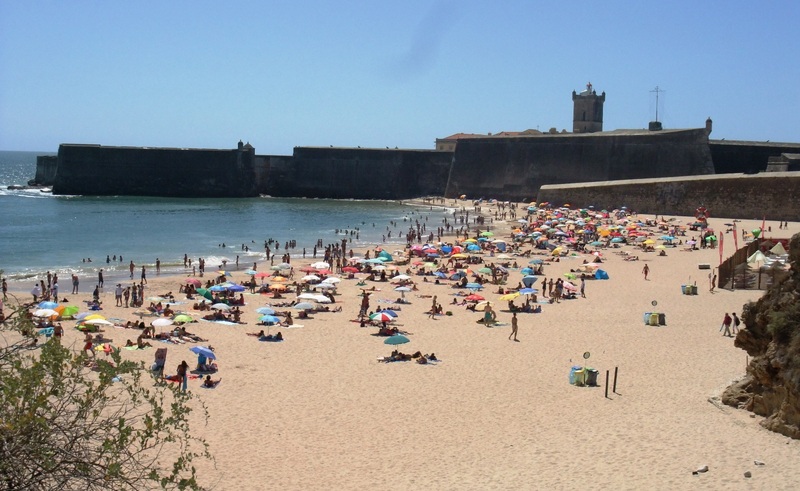 After our sightseeing tour of Lisbon we repaired back to Oeiras for some R&R and laundry! The pool at the complex was lovely so we stayed a couple of days longer than originally planned while we decided where to go next. We had read in the pilot book about a beautiful anchorage (The best in Portugal?) under the cliffs at the mouth of the Rio Sado. 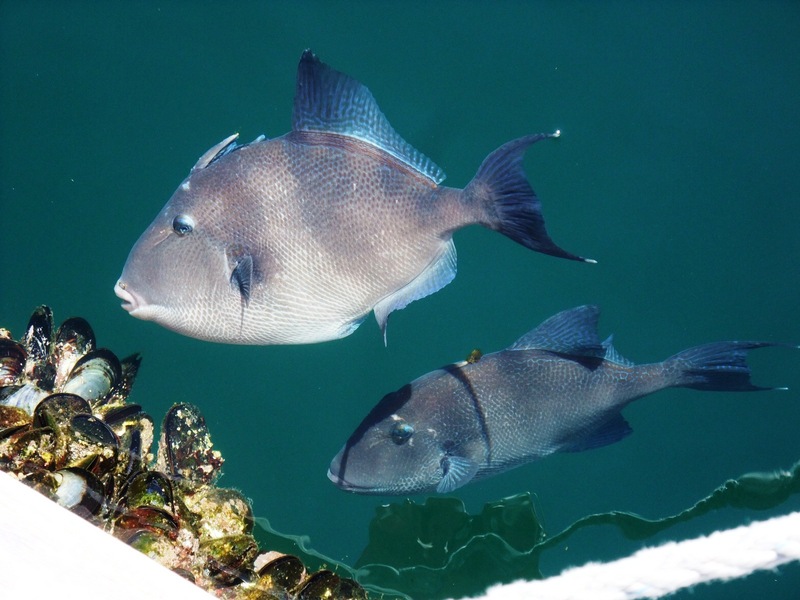 This was confirmed by a couple we met at the marina, we were warned that as the area is a marine reserve there was some confusion as to the areas you were allowed to anchor in. Leaving Oeiras we were surprised at the roughness of the water even though we were in the main channel, the spring ebb was running hard against the onshore swell and really kicked up a big sea even though we were in 30m of water! Usual story in the morning, little wind but a hooley by mid afternoon! 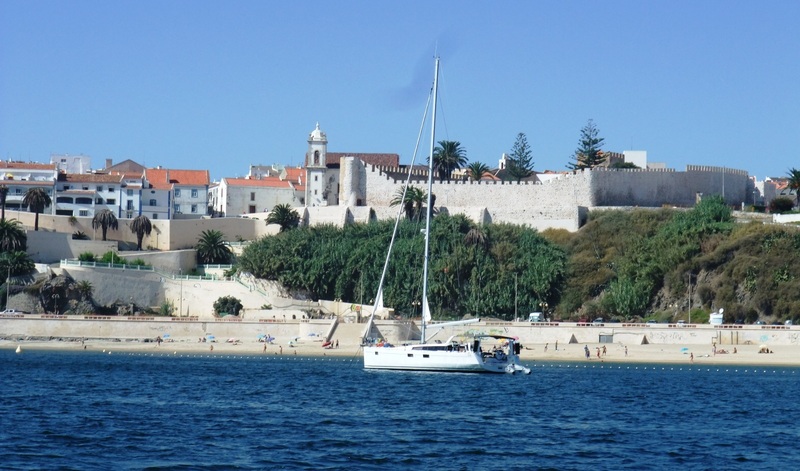 We worked our way in to the ‘anchorage’ at Portinho de Arrabida between the castle on the shore and an offshore sandbank. (A gap of about 200m) Pretty scary as at anything other than a couple of hours near high water the waves break over the bank! 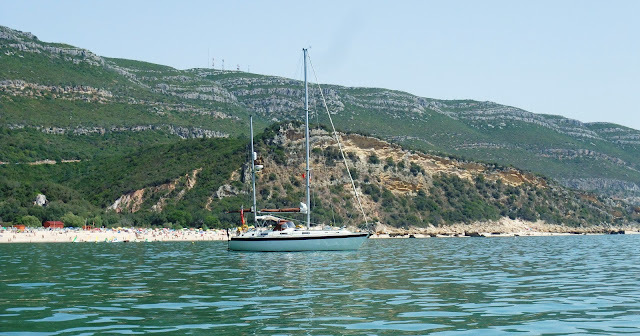 We inflated the dinghy and went to go ashore. Landing was difficult, the only likely place has nowhere to tie the dinghy to, the main beach is roped off for swimming and everywhere else has a very rocky shoreline. We managed to get alongside close to what was originally the harbour wall and met a Canadian guy who lived there; he suggested we speak to the boatman who was ferrying people to the small craft moored close by. The boatman spoke no English but a little French, one of his passengers spoke a little English so we deduced that we were not allowed to anchor as it was a nature reserve and they were trying to protect the sea bed. We could pick up one of 3 visitors buoys and the only place we were allowed to land was by the rocky steps we had previously considered too difficult. The water that was supposed to be ‘crystal clear’ was rather muddy and we couldn’t see the bottom close in so wading ashore was not on. We bashed against the rocks several times on our second attempt to go ashore the following morning and gave up. Pity as it is quite a beautiful spot although there was a lot of rolling and very windy early evening due to the katabatic winds off the cliffs. 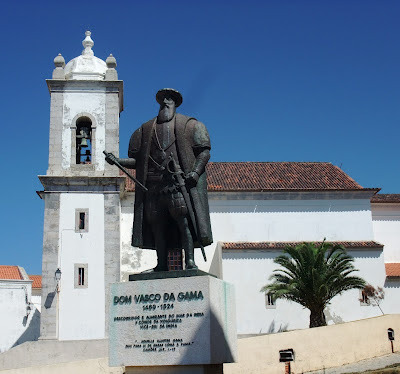 Slightly disappointed at our visit we left after 2 nights to sail the 30+ miles to Sines, the birthplace of Vasco da Gama. 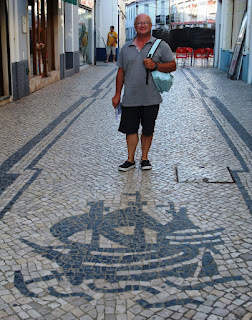 Entrance to Sines was easy as was the sail, motor at first, all canvas up then reef before we arrive. (Same as same as!) We were met at the marina and directed to a berth on the outermost pontoon. The pilot book says berthing here can be ‘exciting’ they are not kidding! Having had enough excitement we walked up to the old town. Sines is quite a surprise as on arriving it looks a commercial port, but as you get into the inner harbour, you arrive at the beach with the castle, palm trees and old town rising in front of you. The industrial areas fade into the background. The town is a real hotch potch of old and new, restored and derelict. 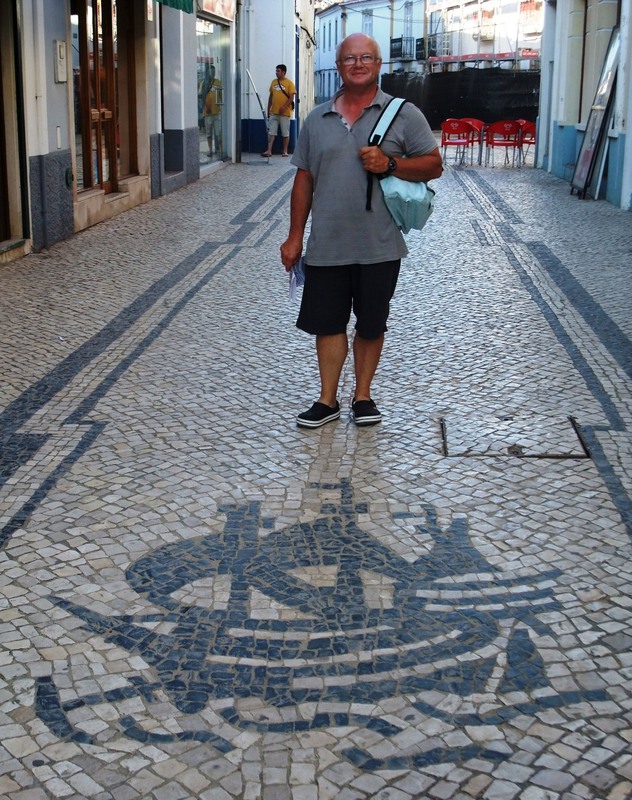 There are some streets with black and white cobbles like Lisbon, here the designs are nautical – galleons, compass roses, etc –reflecting their illustrious heritage. The new promenade along the beach is done in the same style. 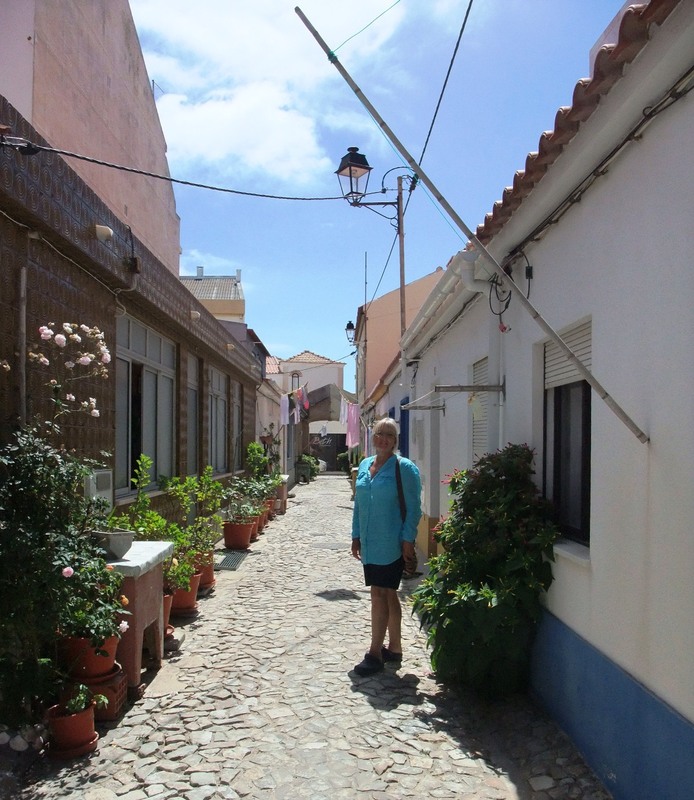 But, most of the streets are narrow and very uneven, old ones still have a gutter in the middle. You really have to watch your step. The houses are mostly tiny often only one storey and quite colourful although the new ones are mainly white with terracotta roof tiles. The castle walls still stand and are open all the time. Through the castle is now our short cut to town. There is a pub inside in one corner where we had a drink looking at the walls, trees and turrets. Amazing. We have spent a couple of days exploring the town and visiting the Museum. Sines has been a port since the time of the Phoenicians and inhabited since time began. Anchored in the bay we could have been in the same spot as a trading ship millennia ago, a humbling experience. The town still trades on its most famous son, Vasco da Gama. There is a whole section in the interesting museum dedicated to him, all in Portuguese so we did not get the best out of it. 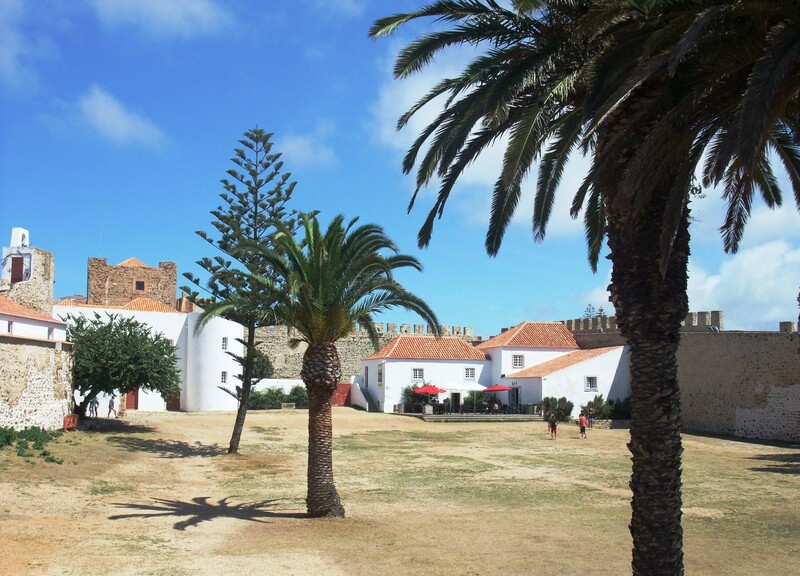 Time to move on and face Cabo St Vicente and the tourists of the Algarve. 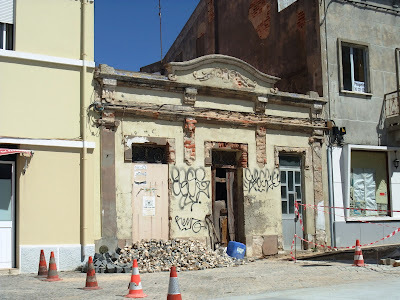 We have mixed feelings about the Algarve having heard good and bad reports. We will find out for ourselves soon enough. Really enjoy reading your blog. Pleased you are having a fantastic experience, keep the blog posts coming. Gail and I are having a busy period of RYA courses so we're out on the water quite a bit at the moment....how is the stowaway getting on? I'm glad you're enjoy yourselves, it's always good to read your blog to find out where you are at the moment. I can see you are in Oerias, and hope Richard is not visiting the base to check out on our project :). It is very nice area and I remember locals saying that Jose Mourinho has got the Villa nearby. When are you planning to head across?? Enjoy last glimpse of the summer.